It has long been known that many herbs & plants are very beneficial for health. 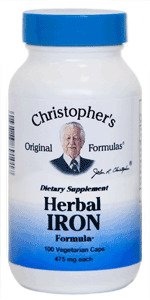 These unique gifts of nature contain a well-balanced set of microelements & vitamins, which is why Dr. Christopher's Herbal Iron Formula Capsule is popular as a source of herbal iron, vitamins & minerals producing a beneficial effect on the immune system, gastrointestinal tract, blood circulation & overall well-being. Also available in Cut (Yellow Dock Combination) form.